Our Set Net "ARMAÇÃO DE PESCA” is located about two and a half nautical miles away from the coast line of Algarve and about 20-60m in depth. When fish hits something, they tend to leave the shore and go out to sea as the avoidance action. The set net fishery is based on this simple rule, but in order to maximize the fish catch and minimize various risk, many investigation must be done in advance. 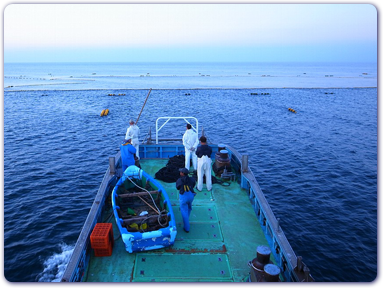 Our set net adopts Japanese up-to-date method of the set net fishery. It aims at the operation with the small amount of investment and manpower saving, and it is made up of the concept coupled with the unique form of the set net and the special workboats. Most of our fishing gears including the net and the boats are imported from Japan. Copyright 2011 © TUNIPEX, S.A. All Rights Reserved.